enlivened by Moyes’ signature humorous style. 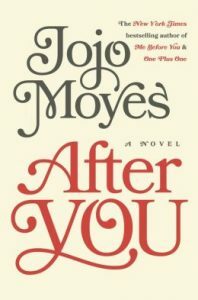 The highly anticipated After You, picks up 18 months after Louisa Clark loses the man she loved, Will Traynor. Coming out of its heartrending predecessor and coming into this subsequent novel, I expected our quirky, vivacious Lou to have trouble leaving Will behind… and that’s exactly what we see. Lou fiercely misses Will, even while she attempts to start anew in London, working in an airport bar. She seems lost, despondent. One night, Lou suffers a major accident and is saved by a caring paramedic, Sam Fielding. The accident is another major setback, especially with her family doubting how much of what happened was actually accidental. Then, a figure from Will’s life surprises her in a way that changes everything and her life is once again thrust into a swirl of drama. Lou struggles to process her feelings, her sense of responsibility, her morphing feelings for Sam, who in a twist of fate, she sees again through a support group. Moyes shines in the humorous, yet often poignant dynamics of Lou’s family, as well as with the very changed and hesitant dynamics of the Traynor family. We again see some societal issues weave through, grounding the narrative even more and making way for the softer side of the story to break through as Lou finds the right reasons, the right anchor, to help her find joy once again. After You doesn’t pack the same level of emotion as Me Before You, nor did it evoke the same type of connection, but it’s a quieter, realistic story of how one struggles with grief, while finding the way forward. Sam and Lou’s relationship didn’t feel quite as believable and epic as I hoped (even though Sam is an amazing, ever-patient man) and the story’s ending left me wanting more, especially after all that Lou had been through. All in all, Lou’s story after Will is certainly touching, but not quite as powerful as its unforgettable predecessor. Oh, I MUST read this! Her writing is always exquisite. Is Sam the medical tech guy? Why don’t I remember who Sam was? Hi Sarina! Sam is a new character, a paramedic that helps her after an accident. He is GREAT!!! !